Phanteks have matured into a manufacturer well regarded for the quality of their cooling solutions thanks to the excellent dual-tower PH-TC14PE and subsequent CPU HSFs. Last year they wow'd us with their first chassis, the Enthoo Primo, which made off with out Platinum Award for innovation and shaking up the premium section of the market. Today, at the start of Computex 2014, they're introducing their latest chassis concept sure to make enthusiasts sit up and take notice: the Enthoo Mini XL. Obviously their naming scheme is a little counter-intuitive here, but it makes sense when explained. The Enthoo Mini XL is chiefly designed for Micro ATX motherboards and includes four PCI slots ideal for dual-graphics configurations. However from that point on the layout hits distinctly non-standard territory. 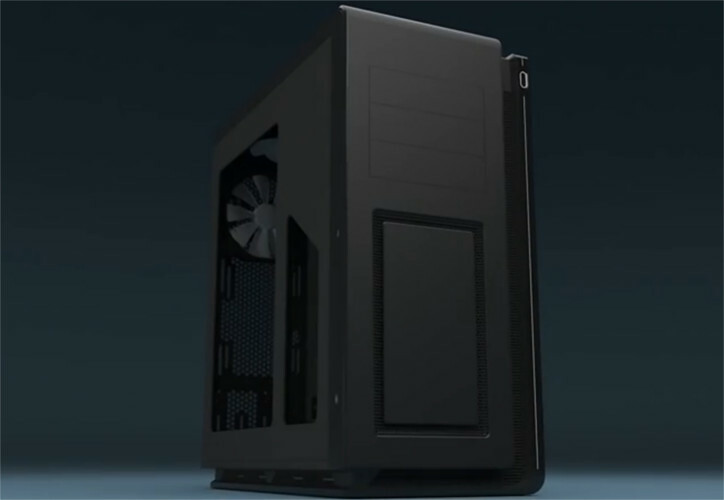 The PSU sits in the top, rotated 90 degrees to accommodate multiple fans in the roof and rear alongside it. Unsurprisingly therefore the Enthoo Mini XL is quite a bit taller and wider than your usual mATX chassis. It gets stranger. The roof is capable of supporting a triple-fan arrangement and large radiator, whilst the two fan placements on both the rear and front can support mid-sized radiators. I presume that it means the case will support 120mm, 240mm and 360mm radiators simultaneously (presuming you can find somewhere to put the reservoir and pump of course), but sadly exact compatibilities aren't yet indicated. Removable HDD caddies and mounting points on the rear of the motherboard tray provide plenty of convenient places for your HDD, whether you're designing a high-capacity home server or lean gaming system. Dust filtered fan intakes should keep your system relatively clear for 24/7 running if necessary. All that said, the Enthoo Mini XL's party trick is an optional bracket which allows a mini-ITX system to be installed alongside the ATX motherboard. Naturally it significantly reduces your cooling flexibility, but this is perhaps the most compact chassis capable projected to be on the market which supports mATX and mITX at the same time. You can see Phantek's demo of the Mini XL concept above. There is currently no information with regards to pricing and availabilty, but it's well worth noting that the Enthoo Primo was celebrated in part because of how competitive the pricing turned out to be.